The wedding season seems like a never-ending riot here! For the past three months, almost all of our friends and cousins are getting married and we are sitting here like a couch potato doing nothing and not planning to get married in next 50 years or so! Because we sang “single bells single bells” this Christmas. 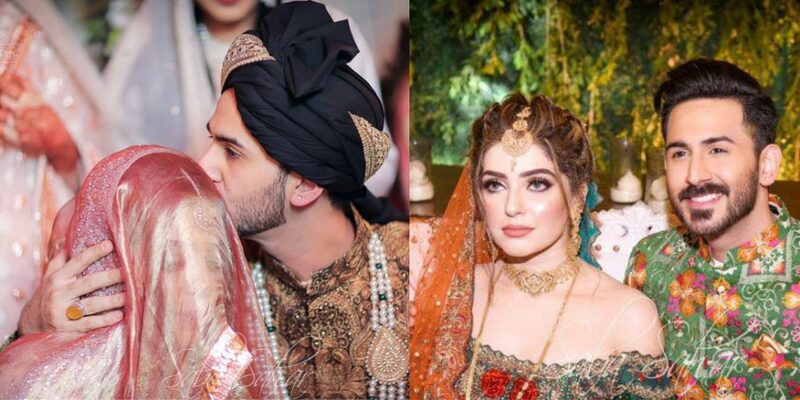 Meanwhile, Pakistani celebrities too, are getting married and seeing all these lavish weddings makes us cry! Which is because some people no matter how hard they try, stay single for the rest of their life, kismat pe bandish hoti hai unki! Sakht kisam ki. But here is this beautiful couple who got married recently and the internet is all love and praise for them! Here’s a photo from their mayoon! And they had a very amazing mehndi! Oh damnnn!! She’s looking lovely! Aren’t they the cutest! Shan being the gentleman that he always has been. And the amazing dance performances on the mehndi! Kinza Hashimi’s dance on Shan’s mehndi has been going viral, as the people loved her moves! Kinza did this performance for the love of her friends and everyone loved it! This must be so much fun! Such performances make mehndi more amazing! Larka waqai bohat khush hai! The newly married Michelle Baig decided to leave the cultural norms behind and wore white and silver on her baraat. Though we have seen ladies wearing red on their wedding, Michelle broke this stereotype and she looked like a princess in her unique dress. The dapper dulha of ours! Wah janab! After watching all the photos we want to get married too! :'( Also, the bride stole the show and the groom’s smile was just the cherry on the top. There were so many celebs who attended their wedding and blessed the couple. All the modeling fraternity and a few actors danced on the mehndi and had too much fun! Shan Baig is an amazing model and actor, may he and the bride start their life with all the happiness and blessings of their parents. Ameen!